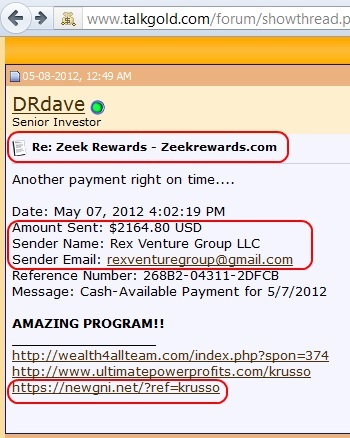 “Ken Russo” regularly made “I Got Paid” posts for Zeek Rewards on the TalkGold Ponzi forum. He also led cheers for Club Asteria, a “program” that encountered trouble from CONSOB, the Italian securities regulator. Meanwhile, Ken Russo led cheers for the bizarre JSS Tripler 2 “program,” which appears to have based its name on the JSS Tripler/JustBeenPaid scam-in-progress purportedly operated by Frederick Mann. As you are aware from previous communications, we have been working hard at getting our Project Genesis off the ground. The goal of Project Genesis is to create a business model that offers the right balance between a product and a rewarding financial opportunity. We’ve created an amazing model that will offer several income opportunities to a wide spectrum of people, from beginners to the more experienced network marketers. In the past, we also informed you that we were consulting with both our legal team and with a compensation consulting firm to help us integrate our existing pay structure with the new model. During these consultations, it has become clear to us that the required changes to the current compensation plan are too drastic and complicated to be done effectively. Based on that, our counsel has advised us to create a completely new business model that will better serve everyone for our new business. On Aug. 17, the SEC called Zeek a $600 million Ponzi- and pyramid scheme. Just weeks earlier, “Ken Russo” left a series of “I Got Paid” posts for Zeek on the TalkGold Ponzi forum. Precisely what Wealth4AllTeam’s “Project Genesis” entails is unclear. The name, however, is reminiscent of an earlier scam known as the “Alpha Project” that was linked to another scam known as FEDI. Read more on the FEDI scheme. FEDI operator Abdul Tawala Ibn Ali Alishtari, also known as “Michael Mixon,” pleaded guilty in September 2009 to fleecing investors out of millions of dollars and to financing terrorism. Oh darn, Dirson Jimenez Santana just spammed my about this one last night and I was thinking about making a test spend. And if I were Dr. Keith Laggos I’d find an attorney to sue these guys. Ponzi schemes should not be allowed to pretend to have “compensation consultants,” they should be forced to pay for real compensation consultants to do the pretending for them. I’ve just gotten confirmation that Ken was involved in ZR to the tune of taking out almost $2300 at a time. Hey, DRDAVE, you might want to put a little stash aside to pay all that money back.